I hope you all had a great Easter weekend! I enjoyed time with my family and am feeling refreshed. However, the last thing I feel like doing after a holiday weekend is make a fancy weeknight meal. This recipe for chicken fajita bowls is so easy, healthy and yummy! When I say this recipe is easy, I am not joking. You literally put all of the below ingredients into the slow cooker and voila, dinner practically makes itself! This is a great one to add to your weeknight meals or it is also a great meal to serve for a big crowd. Thinly slice the bell peppers and onions and add them to the bottom of the slow cooker. Put the chicken breasts on top of the peppers, sprinkle the fajita seasonings, lime juice and add the salsa on top. Turn the slow cooker on low for 5-6 hours. Before serving, cook the rice or quinoa separately and set aside. Warm the black beans and set aside. Once everything has cooked through, in a bowl layer the rice or quinoa on the bottom, add the black beans, chicken fajita mix and all your toppings. Enjoy! * If you would like to cook the rice and beans in the slow cooker, add to the slow cooker on top of the chicken and add 1 1/2 cups water. I personally like to cooke them separately in case I want to use the mix in tortillas or on top of a salad. I am so excited to introduce a new section on the blog called Taylor’s Corner! Taylor is my husband’s best friend who also shares an extreme passion for cooking, more specifically anything he can grill or smoke. Tyler and Taylor (it has a nice ring to it, doesn’t it?) went to high school together, lived together for 5 years post college, allowed me to be a “third roommate” while my husband and I were dating, and most recently were in each other’s weddings. Our dinner parties have gotten an upgrade over the years and have become a big part of our friendship. My favorite kind of dinner parties are the ones where your guests come over wanting to try out new recipes and end up in the kitchen or by the grill with you. And, that is exactly what happens when Taylor and his wife Ashley come over for dinner. 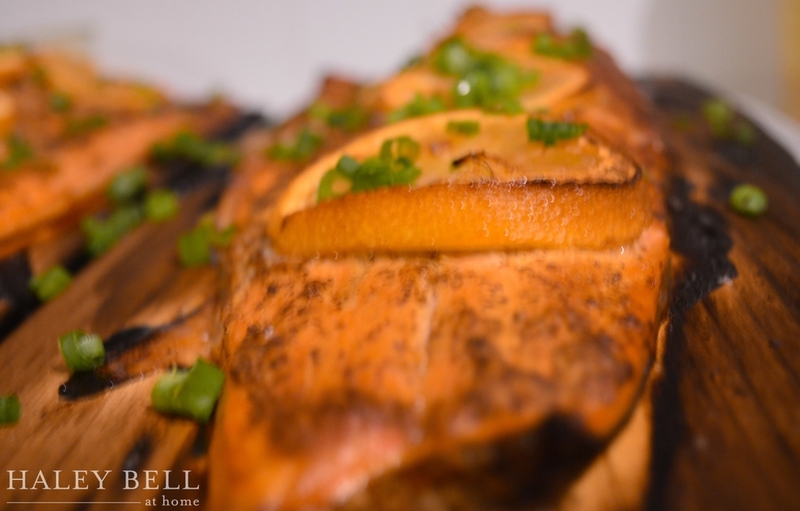 Recently they came over to kick off the 2015 BBQ season and Taylor pulled out all the stops with this amazing cedar plank salmon recipe. It was seasoned perfectly and had a hint of smokiness on the finish from the cedar. We had never made cedar plank salmon and were surprised at how easy and tasty it was. We paired it with alfresco sides like caprese, a spring salad, a loaf of rustic bread and a very yummy dessert that I will be sharing next week. Whenever Taylor and Ashley come over for dinner, one thing is for sure…there is always plenty of good food, laughter and wine! I hope you enjoy this recipe and many more to come in...Taylor’s corner! Preheat the grill to medium- high heat. Place the salmon skin side down on the cedar planks. Salt and pepper the salmon. Spoon the grainy mustard all over the top of the salmon and sprinkle with brown sugar. Slice the lemons and place the slices on top of the salmon. Grill for 20-25 minutes, until flakey. Top with green onions and serve on the cedar planks. Enjoy! It was close to 90 degrees this weekend in Southern California! Between all the ice cream eating to stay cool, it has me wanting to cook lighter meals. I love mixing up our week night meals from the ordinary lean protein, vegetables and healthy carbs on the plate. Although this recipe contains those main food groups, let's face it, they are way more fun to eat! Additional toppings might include: chopped roasted peanuts, crispy rice noodles, cilantro, etc. 1. In a medium skillet on medium-high, warm the olive oil. Add the crushed garlic and shallot. Cook until translucent but not burnt. Add the ground turkey meat and cook until it is cooked through. Using a spatula, break up the pieces as it cooks to resemble ground beef. 2. Add the mushrooms and bell peppers and cook through. Turn to low and fold in the cooked quinoa. 3. In the meantime, combine all of the sauce ingredients in a bowl with the freshly grated ginger. Add the sauce to the cooked mixture once all ingredients have cooked through. 4. Fold in the water chestnuts and green onions. The end of Winter has me craving a warm, breezy day where I can kick off my flip flops and enjoy the sunshine. To cure that craving, I made a light yet filling greek kale salad. It is full of nutrients and protein and the dressing takes this kale salad to the next level. Remove ribs from kale and chop in 1-2” squares and put into a non-reactive bowl. Combine all dressing ingredients in a jar and shake. Pour dressing onto kale and massage with hands for 1-2 minutes. Cover the bowel and put it in the refrigerator for 2-3 hours, or overnight. Add the tomatoes, avocado and feta cheese (and any other toppings of your choice). Toss and enjoy! Stay connected, sign up to receive updates!